Passengers of a cruise ship filed claims of negligent security among other claims against the cruise line due to conduct from one of the members of the crew who was inebriated. 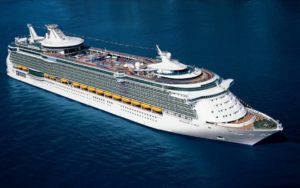 In April of 2004, one of Royal Caribbean’s crew members, Alexander Rutta, became very drunk while aboard the large vessel. At some point on the alleged day of conduct, Rutta was roaming the halls of the ship knocking on passenger’s doors. With his continued persistence, Rutta was able to gain entrance into two different ship cabins prior to making his way into the plaintiff’s room. After causing commotion in the first two cabins, a distress call was made to the ship’s security. At that time, the passengers who made the emergency call explained that there was an incident taking place at that time involving a child who had gone missing. Due to the missing child, there was lack of security available to answer the call regarding the intoxicated employee. member was able to force his way into the plaintiff’s room by gripping her shoulders and pushing his way in. The plaintiff in this case was eventually able to remove Rutta from her cabin, and she then contacted security who explained to her the same thing they had to the first callers. At some point, Rutta was ultimately detained by security. When the ship arrived at the dock in Florida the following morning, Rutta and the victims were all questioned by authorities. Everyone had indicated that Rutta seemed inebriated. No one pressed criminal charges against Rutta, but the following year, the plaintiff in this case filed a lawsuit against the cruise line company for a multitude of claims, including negligent security. When a person is attacked on the property of another person or company, and that attack left them injured, that person can hire a Cruise Ship Injury Lawyer to file a personal injury claim in Florida alleging negligent security. Business owners owe a legal duty to their patrons, and anyone who is on their property, to protect them from foreseeable harm. If the business owner can reasonably foresee criminal activity taking place on their premises, they must take appropriate steps to try and guard against that possible activity. If a person receives injuries due to an attack that occur on or near a business owner’s property, and that business owner failed to make the area safe, they may be liable for damages incurred by the victim. In this case, the security on board the ship was made aware of the potential harm of an attack when passengers called to report the conduct. The fact that there was an inadequate amount of security to handle both of the calls, one for the missing child and the other for the intoxicated crew member helps to demonstrate a claim of negligent security. Though this case was an isolated occurrence on a cruise ship, inadequate or negligent security allegations are certainly effective when filing a personal injury claim when you are attacked on another person’s property. If you have an incident on a cruise ship and feel it could have been prevented with better security, then contact our Cruise Ship Injury Lawyer and tell us what happened. One of our accident attorneys will go over your case with you and tell you what your options are during a free consultation.